We guarantee to beat any like for like specialist Dive Professional Liability Insurance quote by 10%! Our Dive Master insurance covers you for instructing, supervising and guiding to all the recreational Certifying Associations training programmes on an annual worldwide* basis, with the benefit of no common renewal date. 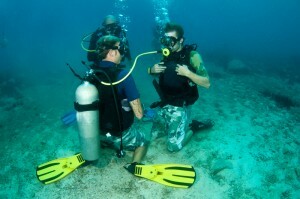 Full diving insurance policy details can be found in the policy wording and keys facts. Pro Diver provides indemnity to the individual instructor named on the policy and will not provide cover for liability attaching to a Company, Trading Style or Entity. To cover a Company, Trading Style or Entity please consider our INDIGO cover. This policy does not include coverage for the USA, Canada, their territories or possessions and is not available to citizens of these territories. *Cover is as an individual participating in these projects subject to declared and agreed standards and practices being followed. This policy will not cover you as the project manager/supervisor or as a business, for this cover please consider our Dive Trade Liability product. We recommend a limit of £3 Million or higher as this is required by various certifying associations & authoritative bodies. Proof of competing quote is required before the guarantee can be applied. Your competing quote must provide cover on an equivalent basis to include but not limited to : coverage on a claims occurring basis, multi-agency cover and costs and expenses payable in addition to the limit of indemnity. This price guarantee is available for a limited period only. Dive Master will not return any documentation received in conjunction with this offer.